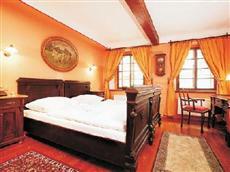 The Hotel Seneca Cesky Krumlov is situated near the central pedestrian square. Guests will find that the Krumlov Castle is only ten minutes away. The Museum of Torture and the Museum of Puppets are both found near this hotel. The Hotel Seneca Cesky Krumlov offers access to Prague airport, located 180 kilometers away, by rental car, taxi, bus, shuttle, or train. Airport transit takes between three and five hours. The city does not offer local public transportation, but the design of the village is very well suited for exploration on foot. Each of the guestrooms at the Hotel Seneca Cesky Krumlov is nonsmoking. All rooms offer minibars as well as televisions. Private bathrooms in each room include showers as well as bathtubs. Guests of the Hotel Seneca Cesky Krumlov will find that there are many restaurants, shops, and cultural activities nearby. The hotel offers an onsite sauna for guests to enjoy. There are also a number of other amenities found at this hotel.